Central and north Queensland has emerged as one of the top wedding destinations, with many couples across the world exchanging vows in the midst of stunning landscape and pristine waters. Couples rely on local wedding services to meet most of their requirements for the big day. 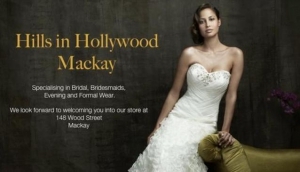 Central and north Queensland boutiques step up to the challenge with a number of top-quality bridal wear shops in and around the region. You are assured amazing bridal wear designs. Check out the list of bridal wear on our site.